Ideal for growing workgroups, the Lexmark C534dtn colour laser integrates seamlessly into your existing infrastructure and offers you intelligent ways to drive down costs. 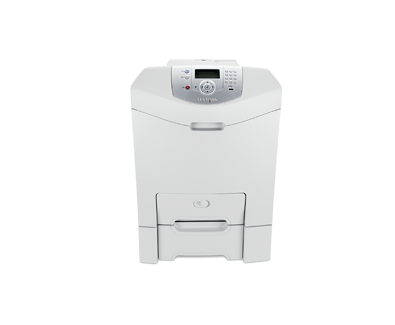 The Lexmark C534dtn is designed especially for small workgroups that don't want to lose time with complicated controls and configurations. Part of what makes it so easy to manage is its intuitive, newly designed operator panel. This includes a user-friendly numeric pad for easy PIN entry and network set-up. Heavy print runs no longer have to mean heavy expenses. With the extra high yield aftermarket cartridges – up to 7K pages for colour and 8K pages for mono – you benefit from an attractive cost per page and less user intervention. At the same time, you can effectively control colour usage throughout your enterprise, thanks to Lexmark's ColorCare technology. 4Ta izdelek vsebuje programsko opremo, ki jo je razvilo podjetje OpenSSL Project za uporabo v kompletu orodij OpenSSL.